Being an adult is great. I mean, aside from bills and responsibilities and stuff. But otherwise, it's a pretty good deal. You get to whatever you want whenever you want, and in a childhood dream come true for me, you can eat whatever you want when you want. Want to eat three breakfasts a day? Go for it. Pizza for breakfast, tacos for lunch, ice cream for dinner? Why not? I mean, your cardiologist may disagree, and it'd be prudent to mix in a salad, but that's not what I mean. I mean: you can do that if you want to. No one can stop you. That, to me, is awesome. So, conceivably, you can have cookies for breakfast. But maybe to feel better about it, we can call them something else. The little lies we tell ourselves to get through, I guess, or maybe, if we're spotted crushing cookies down the cram hole by the stray child , we can say, "Oh these aren't cookies. These are Trader Joe's Blueberry Breakfast Biscuits." Yup. "Biscuits" is what they're going with here. Bwahahaha. No way. These things are cookies through and through. I mean, they're even sold right alongside all the other cookies, and not in the energy/breakfast bar area. These cookies biscuits morning-minded munchers are pretty tasty, though. For its basic concept, think of a more granular oblong graham cracker, and thant's fairly close in both taste and texture. There's a little something extra, though, and it's not the blueberries. Vaguely familiar, tip of tongue, couldn't quite place it till scanning the ingredients - rye flakes. There's a pretty hefty dose - not enough to be offensive or anything, but it definitely adds a blueberr-rye dimension. The berries themselves are of the typical dried variety, and intermittently and unevenly sprinkled through out - some wafers were sans berries, others where blue enough from berries to look almost like a flattened Smurf. As you can probably see, these are some fragile biscuits too. I did nothing to those pictured except the normal rigors of a morning commute to my desk, and I got left with a pile of pieces. So, they're probably not the best for on the go, like while driving, unless you don't mind brushing a dusting of vaguely greasy crumbs off your shirt. And don't count on them for a full breakfast. A good morning snack, or part of a healthy breakfast, with some yogurt perhaps? Sure. The biscuits were a welcome addition to my usual apple and coffee workweek breakfast, but despite all that fiber, I was still hungry for lunch not all that much later than usual. Anyways, the wife and both like them, as do our kiddos when we let them have a munch. Save the morning cookies for the adults, kids. For only about $3 or $4 for a fivepack each with four in there, it's not a bad deal, either. These aren't my favorite things ever, but they're good enough to warrant a repeat purchase already, and I'd love to see these expanded into different flavors..like, say, cherry? Sounds delish to me. Matching 3.5s. You are missing the British connection! The British call cookies biscuits, and they have more kinds of fiber-filled biscuits over there called digestives. That's more what these remind me of, and I agree with you on all other fronts...tasty and fun, while I couldn't eat just that for breakfast (although 4 cookies is a decent serving size!). Would also be great for tea time! These sound & look just like Belvita breakfast biscuits! These taste better than the mixed berry belvita biscuits! I just bought my first box and I already want more! Love these! And, they're only $2.49 a box. I had a biscuit today and less than 15 min. Later I was sick. Anyone else have this happen? I love the Trader Joe's blueberry breakfast biscuits! Unfortunately I was told at my local Trader Joe's that they have been discontinued. I am so disappointed! 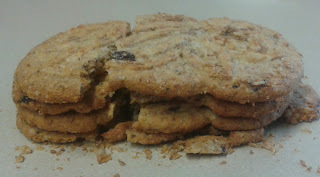 I want to point out that these are not cookies as the reviewer suggested. They have 5 grams of protein and 5 grams of fiber per serving. And, they are no more sweet than other breakfast bars. Hopefully there will be some clamor and Trader Joe's will bring them back.